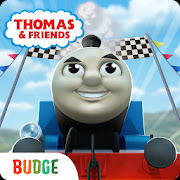 Join Thomas and his friends on exciting racing adventures! Race as your favorite engine on incredible tracks filled with twisty rollercoasters, splashy waterslides and epic jumps! Play against rival engines or challenge a friend in the 2-player mode! Use speed boosters to help you race your fastest and collect golden cogwheels to upgrade your engines. Full steam ahead!